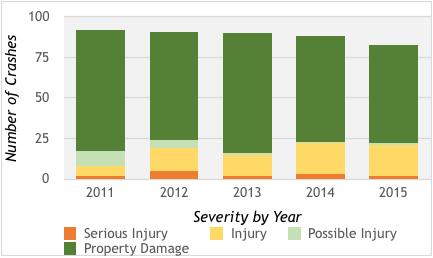 Crashes on 64 Between Charlottesville & Crozet – More on Less in 2015? Both 250 and 64 into Charlottesville look to be disasters. What the hell is going on? That felt like a common theme in 2015, particularly in the second half of the year. Another day, another wreck on 64. As of right now, it looks like 2015 had the fewest crashes in years. Keep in mind that the 2015 data is preliminary; I’ll provide an update once they send me the final data. I asked Albemarle County Police, then the State Police, then the County Police, then the DMV, then the State Police, then the DMV. Sigh. And the DMV came through! The * means “preliminary data.” I’m going to check back with the DMV in late February to see how/if the numbers have changed. @realcrozetva (3) People follow other cars WAY, WAY, WAY, WAY too closely. Car going 70mph travels 102 ft /sec. Should stay 150 ft behind. Make your own crash data maps at the DMV’s site. Pretty useful, actually. Would be interesting to see the numbers based on diff times of day b/c I would venture to guess that the number of morning accidents, particularly M-F, have increased drastically over the years!